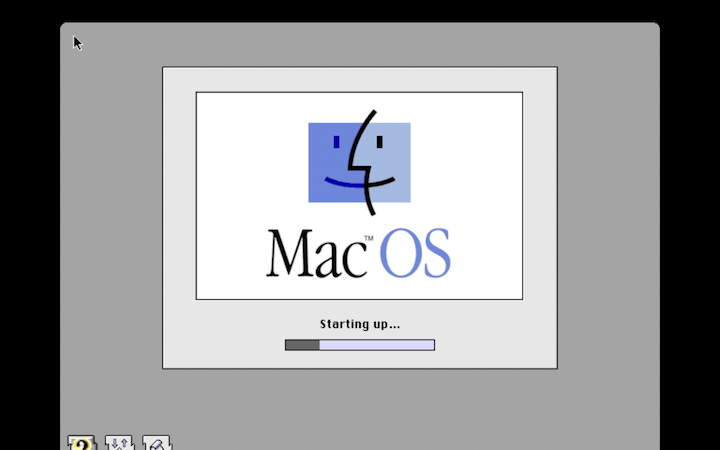 Using any of the "working" variants, I'm able to boot System 6.0.8 to the finder, adjust screen depth (for color computers), and run software. But I can't figure out how to change the screen resolutions on the systems that use an external monitor; they're stuck at 640x480. From the source on github, it looks like I may be able to change it programmatically, but this seems odd, as MAME is supposed to emulate the actual hardware, and yet doesn't appear to properly emulate the monitor output. Am I missing something here? Also, even though they're all listed as working, I have yet to get any of them to boot anything above 6.0.8; 7.0 and higher hang shortly into the welcome screen boot process, even with extensions disabled. And the speed seems a bit slow, even though the debug reports Average speed: 99.75% when I terminate. As an aside, I'm creating runnable apps using mame64 SDL for OS X; all pre-configured for specific hardware, with a blank CHD set up and just needing the ROM and install floppies / CD added to make it functional, with no fiddling around. Seems to work well, except for the fact that I can't change screen resolution or actually boot anything later than 6.0.8. Have you tried 7.5.3? I've got a working 7.5.3 Rev. 2 (the one that used to be a free download from Apple's site) that boots and generally runs great in MESS. I set it all up years ago, so I don't quite remember, but I don't think I had to do anything special beyond getting the install images, as well as something to boot from, into CHD format. If you got a MacII package ready, adespoton, please consider sharing it. I would like to try it with one of my OSX hosts, to see how it plays compared to MiniVMac. So, I decided to modernize my MESS build from the old build that I've had sitting on my hard drive, just to make sure no new issues have cropped up in the meantime which might account for the trouble that adespoton was having. Interestingly enough, it seems that MESS no longer exists as a separate entity, but has been folded into the MAME project. I'd have to say that this is a good thing, since MESS was notoriously un-Googleable, and I never did understand the need for these to be two separate projects given how much overlap there is between them. Thanks; yes, 0.159 is the version I had been using as well, but I figured there might have been some improvements in the emulation since then. Seems like the opposite is the case. My next task was going to be to use the new compile options to compile with only the Mac driver target, for a nice stripped-down binary -- but with those regressions confirmed, I think I'll hold off on that. Well that's weird, since while I did get your hang during startup with the current 0.178, my 0.159 build boots and runs 7.5.3 Rev. 2 beautifully. Over here, anyway. Do you get the hang with the binary I posted? Ah; I think there was a miscommunication. I only have this problem with the 0.178 MAME builds; the 0.159 MESS builds work fine. I was just hoping the later builds would be more complete, based on the changelog. Er, on second reading, no; we're using MacII ROMs. I'll look further back through the changelog to see if I can figure it out. Unfortunately, even when using the older ROM format, the boot process still stalls at the same location as before. So it would seem that this particular change is not to blame. I hope this works for others; this is just a wrapper and set of instructions around Charles' 0.158 build, with some blank CHDs included. As the Readme.txt says, you need to bring your own compatible ROM and install images. Thanks for your work, I really appreciate it. Right now the SDL 2 Library is missing on my side, so the package you made available won´t do anything. I´m planning to upgrade my T420 to Sierra these days, we may fix the SDL issue after upgrading. That's weird, full-screen mode works fine with my trackpad. Mine is the older, non-Force Touch one, though. I wonder if 0.158 has an issue with Force Touch trackpads? So, I decided to compile a bunch of the different MAME releases in between 0.159 and 0.178 to see which particular version introduced the regression that's been preventing 7.5.3 from booting. From my testing, it appears to be 0.175; 0.174 and before boot 7.5.3 without issue, whereas 0.175 and later do not. Therefore, whatever caused this bug could probably be found by digging through the changes that were made specifically in version 0.175. In the hopes that 0.174 may not suffer from adespoton's trackpad issue, I've put together a binary package for 0.174. Because the combined MAME/MESS binary is huge, I've compressed it using xz instead of one of macOS's built-in compression formats, in order to reduce the bandwidth load on my website. To extract this, use one of the various extraction tools available for macOS, such as The Unarchiver, Keka, or, if I may be so crass as to plug my own software, Pacifist. This only occurs on Retina Displays; things seem to display correctly on standard displays. This may not affect windowed mode; I didn't test it. I tracked down the display regression to version 0.160, which means that to avoid the display bug, the 0.159 build I already posted is probably your best bet, so I'm leaving that one up for now. So, I tracked down the bug that was causing System 7 not to boot. The code for the Zilog SCC driver contained what appeared to be a typo; a simple fix to that, and 7.5.3 Rev. 2 boots again. I've submitted a patch to the development team; hopefully it will be incorporated in the next release. As a side bonus, the Retina Display issue I was having before seems not to be happening with the latest git, so perhaps that has already been fixed by someone else. I've also made a binary of the latest source from git with my fix applied; you can download that at the URL below. Note that this binary will only run the Mac emulation; I left out the other emulators to make the download smaller. I am trying to get the MAME Mac LC III emulation to boot and I am not having much luck. I have system 6.0.8 on floppy and that boots but won't run on on a Mac LC III because it's too old, and I have several bootable CDROM images for 7.5.3, 7.6, 7.6.1 and 8.1 but I can't get MAME to boot a Mac LC III emulation with any of them. Does anyone have a boot disk or CDROM that will boot the MAME Mac LC III emulation? Can someone post it here, pretty please? Thanks! You'll need System 7.1 with the LCIII system enabler or 7.5.3 to boot the LCIII. I'd go with 7.5.3, but it sounds like you've already tried that. I haven't tried UME Mac emulation since the Mac II support was added -- I might try that soon.